In its current site, the museum parking lot, sandwiched between ornamental gardens and scrubby wetlands, the Field Station will collect 400 observations about objects in the socio-ecology. 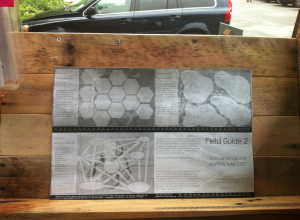 This Field Guide is a mutating weekly one page book that begins as a designed entry form with data fields for participatory observing. Each week observations collected in the parking lot here at the deCordova will fill the book. In four weeks the final issue will be released: a map of this ecology, its interconnections, objects, stresses, and resiliencies. Join us in observing and mapping our place.